Everything I know about Eric Dolphy I learned first from Don Berryman, the “Chief” of the Jazz Police. Dolphy’s Out to Lunch recording from 1964 was one of Don’s first introductions to jazz. I, on the other hand, bought the album sometime in the 1990s and listened once, convinced it was way too “out to lunch” for me. Over the next decade I heard (and observed, more importantly!) more avant garde music and slowly developed an appreciation, even a liking for some of it. But it never occurred to me to go back to Eric Dolphy until Don suggested I drive down to Northfield to hear a band of area musicians reinterpret the OTL recording session. The concert on the St. Olaf campus was Don’s idea, prompted by hearing vibes master Dave Hagedorn and the band Source Code try out a chart of Dolphy’s “Hat and Beard.” I remember it was about 20 below zero that night but Don, his daughter Becky and I piled into the Mini and attended the inaugural concert of the Out to Lunch Quintet. It was tempting to just stay home and hide under a down quilt. After all, I wasn’t a fan of Dolphy. Yet there were five reasons to attend that I couldn’t ignore—Dave Hagedorn, Kelly Rossum, Dave Milne, Tom Lewis and Phil Hey. How could an evening with these musicians be less than stellar? Don said that back in the early 70s when he first heard this music, it “blew my mind.” In 2005, it blew my ears. In a good way. And the audience reaction was enough to encourage the OTLQ to set up a live recording session the following year at the Artists Quarter. 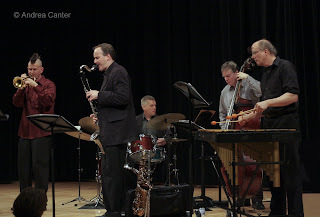 Since then, the quintet presents at least one performance each year, most recently last Thursday night at the MacPhail Center for Music as part of its Jazz Thursdays series. Like that concert in Northfield, this one was cosponsored by the Twin Cities Jazz Society, a big deal as the TCJS is more known for its presentation of traditional and classic jazz, not Eric Dolphy and beyond. The centerpiece of the program at MacPhail was the entire set list of the original recording, bookended by two other Dolphy compositions, “G.W.” (referencing the great bandleader Gerald Wilson, not that other G.W.) and “Out There.” Of course each time I hear “Hat and Beard” (named for Thelonious Monk) or “Straight Up and Down” or “Gazzellioni” or the strangely sweet ballad, “Something Sweet, Something Tender,” or the title tune, it seems familiar in melody but unique in improvisation, which of course is the point of jazz, to never be played the same way once. But unlike much of the music I typically listen to, Dolphy’s compositions lend themselves to not only endless possibilities of theme and harmony, but infinite and constantly evolving shapes. Each tune seems to present a new challenge in design, and the five musicians take their respective drawing tools and set about to collaborate on line, color, shading, and above all, shape. Shapes might be sharp and angular, curved and curled, elongated or truncated. Close your eyes, and you can see the music morph from one shape to another like a giant amoeba. And like the movements of the dance troupe Pilobolus, the sounds and shapes of the OTLQ constantly move, often with a great deal of humor. 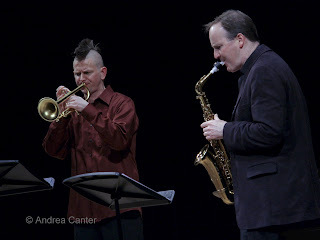 Bass clarinet (Milne) and upright bass (Lewis) are often sparring partners, as are the brass (Rossum on trumpet and Milne on alto sax). 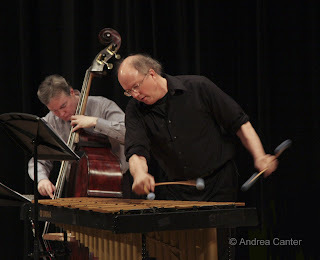 Percussion—Hey on drumset, Hagedorn on vibes—provide accents, embellishments, and particularly with the vibes, solo islands of sanity in the midst of cacophony. In fact it seems that the drums and vibes are responsible for maintaining a tether, an anchor that keeps the music from flying out of orbit on a course of no return. And maybe that is the ultimate appeal of the music of Eric Dolphy—not matter how far from home you travel, no matter what method of transport, you know you will return, and your ears will be just a bit larger than when you left.